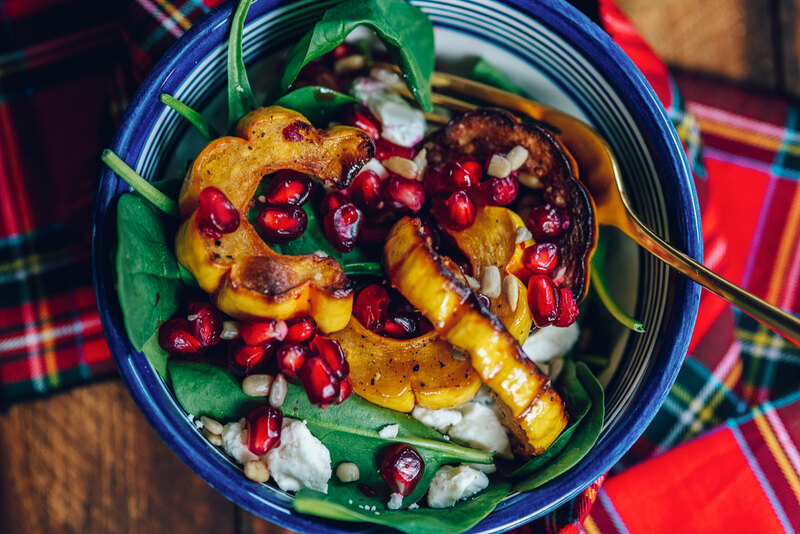 An easy and healthy winter salad recipe with roasted delicata squash, feta, pomegranate & spinach that’s perfect for your holiday table. Vegetarian and gluten-free. I love having a big colorful salad on our holiday table as a healthy option amid all the indulgences. 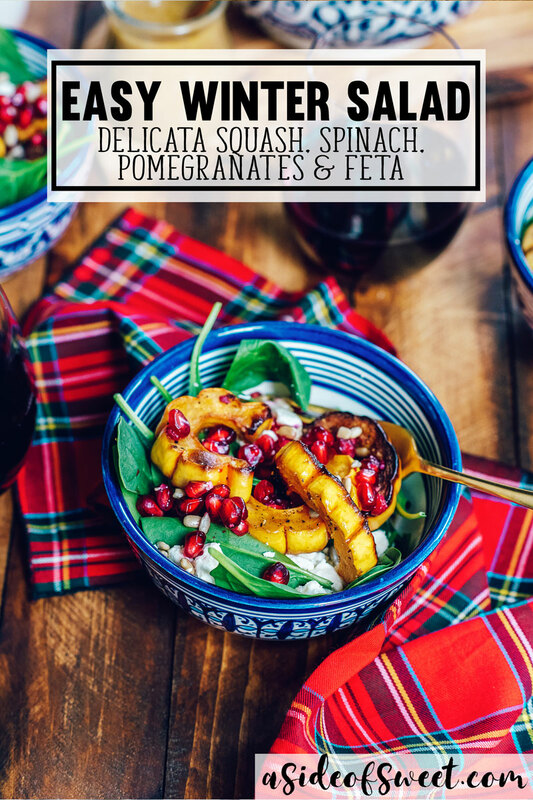 This winter salad tics every one of my boxes – the feta brings a cool tanginess, the roasted delicata squash is warm and sweet and the pomegranates are perfectly tart. It’s satisfying and filling and will be the perfect addition to your holiday meal. Read on for the winter salad recipe.. The holidays are the perfect reason to be mindful of screen time. There are so many opportunities to connect with family and friends this time of year – and so many opportunities to miss out because you’re distracted by your phone. It’s something we’ve been working on for much of the year, thanks to Wente Vineyard’s #MakeTime initiative. Wente started the movement to remind people to “Make Time” for the things and people that matter. Whether it’s enjoying music, getting outdoors or meeting up with friends for a phone-free meal, there’s so much to do! I’d love to tell you I’ve been perfect and that I never slip up! Even after working at it consistently for the last six months, it’s still something we need to check in about. Pat keeps an eye on me and I do the same for him. It’s strange to think about all the things our phone has become an integral (and unnecessary) part of. I think a lot about the act of waiting. When was the last time you waited for anything without checking your phone? Even while we were traveling for Thanksgiving, I used my cell phone until the very last minute before our plane took off and was back at it the moment we landed. On the way home, I tried to be more intentional with how I spent my time waiting. I talked with Pat a little about our time at home and also read a medical journal that I had tucked in my carry on. It was a much more productive use of my time. 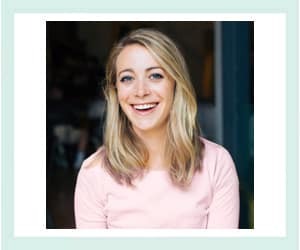 No matter what motivates you, it’s easier than ever to be accountable, whether it’s blocking websites and apps for certain times of day or checking the use timer that’s now built-in to apps like Instagram. Are you working on cutting down on your screen time? If so, what are some things you’ve done with that extra time? 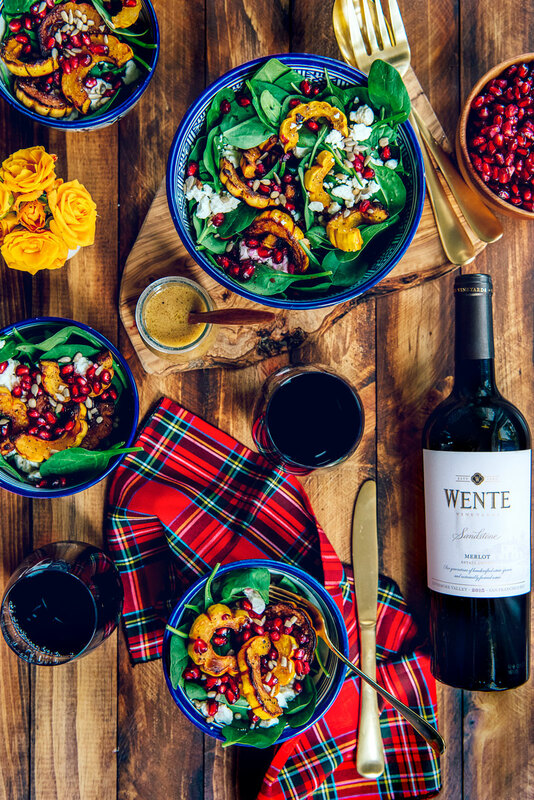 The Wente Vineyards 2015 Sandstone Merlot has become one of my favorite wines. Merlots have so many stereotypes that often leave them overshadowed by varietals like Pinot Noir and Cabernet. Let me tell you, the Wentes know how to do Merlots. The Sandstone Merlot is lighter than you would expect, perfectly balanced and has a bright finish. Petit Syrah is added to the Merlot after aging and it is then aged again. This process gives a deliciously complex structure with diverse flavors. 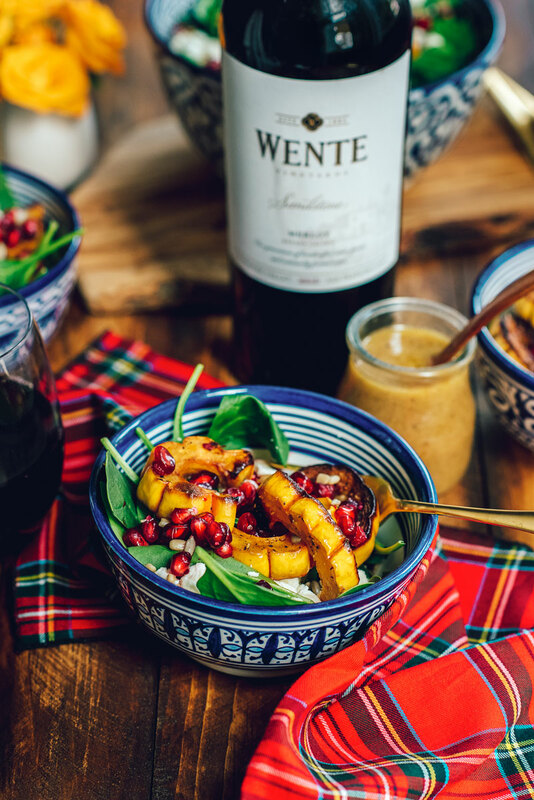 You’ll find notes of dark cherry and berries that pair well with the sweetness of the delicata squash and the tart pomegranates. It also makes it very versatile – it pairs just as well with this vegetarian salad as it does with chicken or fish. It will be a welcome addition to your holiday table and is a great value for the $20 price tag. Delicata squash is easy to prepare – just slice and roast! It doesn’t need to be peeled. This vegetarian salad can easily be made vegan by omitting the feta cheese. It pairs perfectly with a glass of Wente Vineyards Sandstone Merlot. 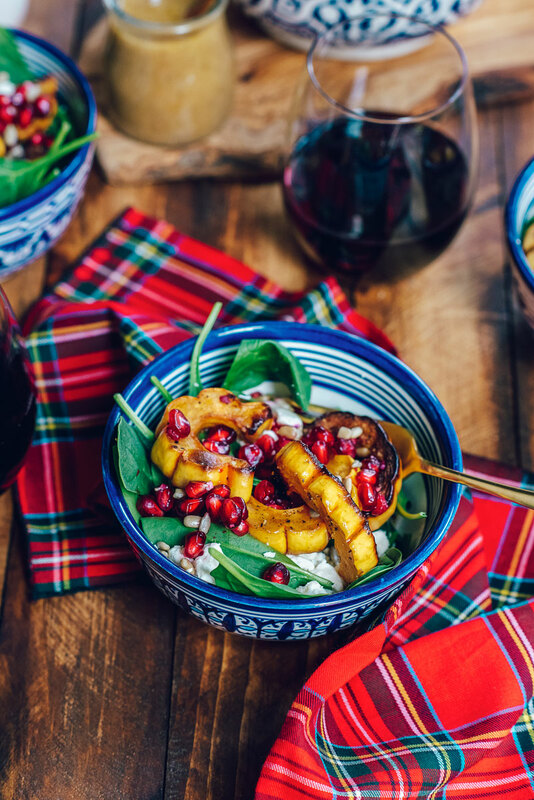 This salad is an explosion of flavors with the tanginess of the feta, sweetness of the delicata and the tartness of the pomegranates. 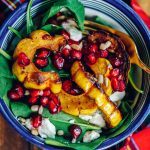 Easy and healthy winter salad recipe with roasted delicata squash, feta, pomegranate & spinach that’s perfect for your holiday table. Vegetarian and gluten free. ½ cup pomegranate seeds, about 1 pomegranate. Halve the delicata squash lengthwise and scrape out seeds and pulp using a spoon. Slice crosswise into 1/2-inch pieces. Line a baking sheet with parchment paper. Layer the sliced delicata squash on baking sheet and drizzle with olive oil. Season liberally with salt and pepper. Roast for 40 minutes, tossing halfway for even roasting. 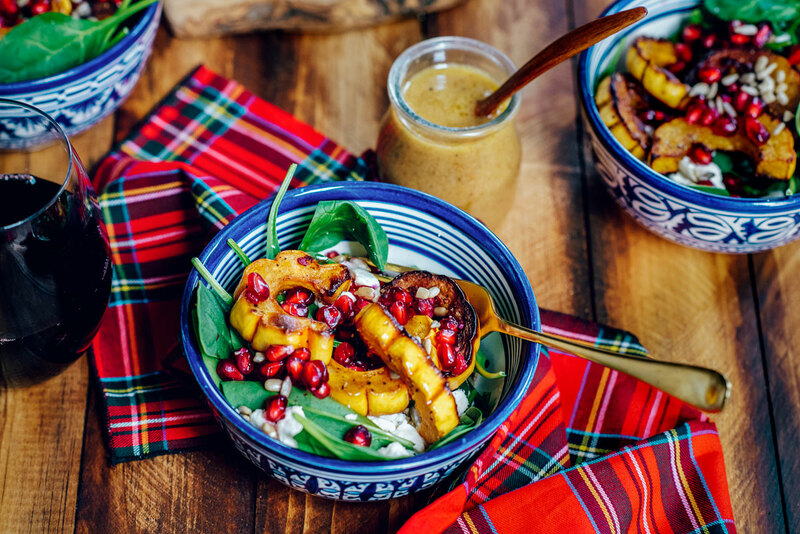 Layer spinach, pomegranate seeds, feta and pepitas in a large serving bowl. Toss salad with honey mustard vinaigrette immediately prior to serving or serve with dressing on the side. Mix vinegar, mustard, honey, salt, garlic powder and pepper in a sealable container. Shake vigorously to combine. Whisking constantly, stir in the olive oil in a steady stream. Use immediately or will keep in a sealed container in the fridge for 2 weeks.